Zion Episcopal Church in Charles Town, WV traces its origins to St. Georges Chapel erected in the 1770’s. The original church on Zion’s present site was built around 1815. The present structure was constructed on the same spot and opened for services on December 6, 1851. George Washington's youngest brother Charles established his homestead nearby in 1780. The church's graveyard indicates the great local influence of the Washington family. There are twenty Washingtons buried there. Approximately seventy members of that family are interred alongside. Enclosure of the churchyard, filled with graves, was completed circa 1880. 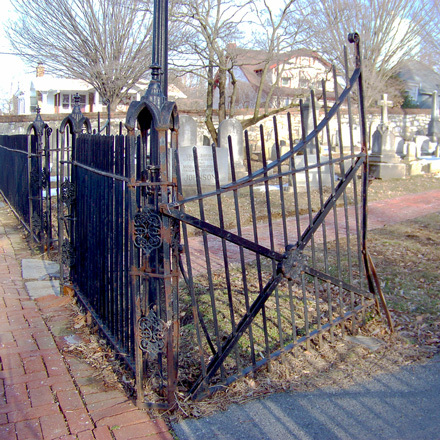 The fence and gate were products of The Champion Iron Company in Kenton, OH from 1876 to 1884. The churchyard gate was too narrow for modern trucks, and it accumulated damages large and small. 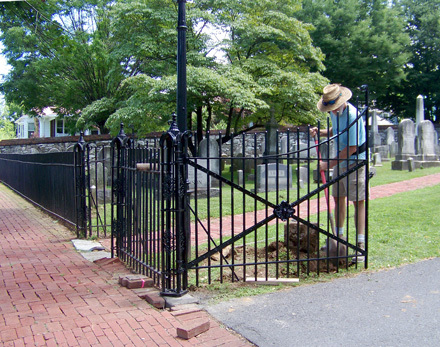 The church commissioned Anvil Works to repair and restore the gate with greater width to accomodate today's vehicles.